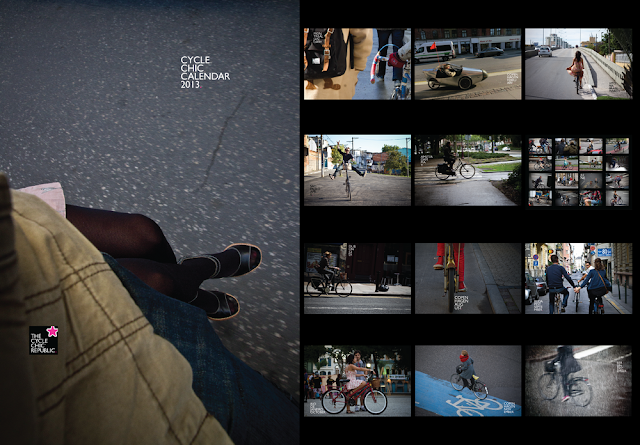 Cycle Chic®: Cycle Chic Calendar 2013 - Out Now! Cycle Chic Calendar 2013 - Out Now! For the fifth year running, the Cycle Chic Calendar 2013 is out! We're pleased to present this calendar and hope it can get places in time for Christmas... and January 1st. This year the calendar features Cycle Chic photos from Copenhagen (no surprise) as well as Montreal, Rio, Sao Paulo, Vitória (Brazil), Amsterdam, Budapest, Zagreb, Dublin and, Berlin. We've even chucked in a velomobile in a moment of craziness! But the guy is the most dapper chap ever to grace a velomobile and he rides past our offices every day. If that's not crazy enough for you, we even feature a tall bike and drop handlebars! Enjoy. It's available over at Lulu.com.